I'm applying for a variation on my Firearms Certificate for a larger calibre rifle for deer stalking and target shooting. I've got my sights set on (forgive pun) 7x57 (7mm Mauser) as it has good ballistics and moderate recoil. I've tried other calibres and find the .308 quite harsh, for me any way. Any thoughts anyone? The 7mm Mauser is not always the easiest weapon to find, or to find the ammunition for. I'd suggest that the 6.5x55 Swedish is worth a look. Fairly flat-shooting, and much more tractable a beast than the .308. In fact, it is noted for its moderate recoil, and is a popular stalking calibre so ammunition supply is not a problem. I use the 6.5x55 and the .308, and both do the job well enough. In fact, if it wasn't for wild boar I'd probably get rid of the .308 and just use the Swede. I'd rather taken to the Ruger No.1. Our local dealer has one in 7x57 they say ammunition isn't a problem, expensive but not a problem. The Ruger No.1 isn't everyones cup of tea though. However, the 6.5x55 looks, on paper at least, an attractive proposition so thanks very much for your input. One note of caution - if you're planning to have the rifle threaded for moderator, be aware that this will invalidate any guarantee from the manufacturer if you find the thing chucking rounds all over the place. Steyr-Mannlicher rifles come threaded at the factory, and have a rustproof Mannox coating, plus the superb safe bolt system. I've tried Tikka (rubbish), Sako (very good but very expensive) Ruger (didn't care for the clunky bolt and breech mechanism), and Remington (the Nissan Micra of the rifle world), but now all three of my centrefires are Steyr-Mannlicher and I wouldn't change them for the world. (I haven't got shares in Steyr BTW, I just think they're absolutely superb). Thanks for that I've not heard of them. I'll do some research. I have 2x Tikkas (and a CZ) and like them very much, except for the varmint stock, but that was always going to go anyway, they shoot straight from the box and many deer and vermin have fallen to them both. What calibre(s) do you use and for what? 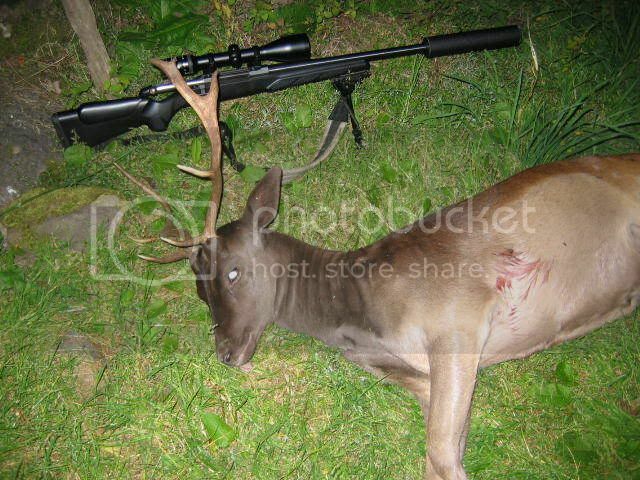 Tikka 595 - .222 for roe deer(I live in Scotland) and also fox/crow/feral cat. CZ .22 rf for all small "game" and vermin. I am very fond of Mausers, and have shot quite a lot with a 6.5. A very nice gun. Otherwise, my weapon of choice is a M98 7.62x63 (30.06). It is a calibre it is easy to get ammo to, and if you load yourself, you can get quite a few cartridges with very light bullets (I saw one at 90 grain), who shoots very straight and is good for smaller game. You don't have to shoot with a 150 grains bullet with a 7.62 (or my favourite, Norma's 200 grain for Elking). I know nothing about this but after the above post I had a thought. Why do you have so many diff calibers when you can get amunition with different loads & bullet weights? Would one weapon with a selection of ammo work? No, that's why there are so many calibres available. Each has it's own niche. You can tweak the same cartridge with different bullet weights and powder charges but only within certain limits. You wouldn't really want to use a .45-70 for 25 metres paper target shooting when a .22LR is far more suitable (and many times more cheaply). There wouldn't be much, if anything, left of a munjac if hit by a .50 BMG. There's also human factor some people can't shoot heavy hitting rounds simply because it's too uncomfortable for them. This is why I asked the question I did, well in part it is. For me the .308 is too harsh for others it's ideal. Horses for courses type of thing. not really, but you should be completely covered with 3 rifles, if you choose them well. I would choose a .22, a .243 and my old 30.06. A gun for every eason. You might want to exchange the 30.06 for a 6.5. With a twelve bore shotgun on top, you're set. I shot a 7.62 NATO tonight. That's about the same as a .308. Noisy beast.